To talk about ‘KL Gangster’, I feel that it is just as important to set the context for the film, certainly from the box office point of view. This film is officially the highest grossing Malaysian film of all time, collecting over RM10 million on its way to the top of the throne. In truth, such a development has been in the offing for a while; while no film breached the RM6 million barrier for around 15 years since the early 90s, the latter part of the noughties saw a bigger number of films break that. As RM6 million gradually increased to 7, and then 8, it had left me wondering when that magical barrier would be broken, and which film would have that particular honour. This film, then, at that very least, deserves to be recognised and acknowledged as such. Having said that, it is an empty can of worms? Many other films also make a certain amount of money, but what kind of story does it tell? What kind of character does is have? The story, we’ll get to in a short while, but first, the character should be considered. For a while now I’ve encouraged my students to consider looking at the characters they create for their scripts not within the spectrum of good or bad, but rather, as human beings, complete with their pros and cons. Ultimately, then, there is no right and wrong, and shades of grey, rather than a very definite black and white form of characterisation, is, I feel, something to be encouraged. An example I had often used is of a loan shark gangster or money collector, who, within the opening scenes of a film, would be involved in some very shady and violent deals. Coming out on top, later on in the film he would then spot a less-advantaged person (perhaps a blind man, perhaps a homeless guy). Finishing his meal (the setting is usually somewhere at a food court, for some reason), he would walk over to that man, and give him a RM50, maybe even a RM100 note. “What, then, is this guy?” I ask them. “Is he a good guy, or is he a bad guy?” It is, of course, a trick question of sorts, but the prolonged period of silence that followed that question suggests that, at the very least, the wheels are turning in their heads. The rush for the Malaysian Mega Sale was intense for some. Lo and behold, such a scene appears. The antagonist, walking past a pair of homeless of children sleeping on the streets, stopped suddently and turned around. Doubling back, he squatted down and tenderly stroke the hair of one of them, before taking out his wallet and depositing significant sum in their pockets. It is on the basis of that alone that I happily declare the film to have more heart than ‘Transformers 3’. We are, however, getting way ahead of ourselves. The aforementioned antagonist is Jai (an almost unrecognisable Ady Putra). 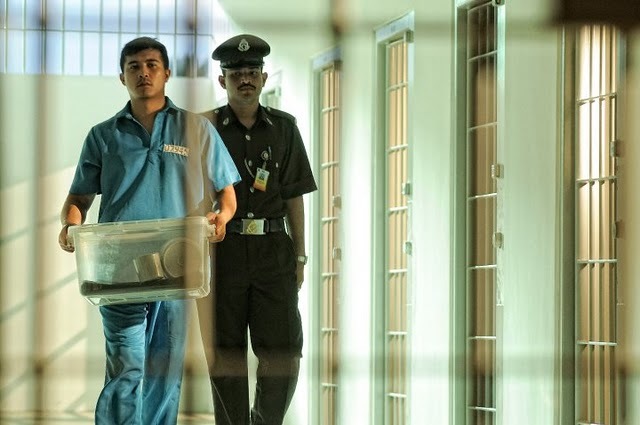 His brother, Malek (Aaron Aziz), is released from prison after serving time, and he is looking to start his life anew. In recognition of his years of dedicated service, his former gangster boss King (Ridzuan Hashim) allowed him the space live and prosper in his own right. However, King’s new muscle Shark (Syamsul Yusof, the film’s director) is not all that happy with that particular arrangement. Fikri actually had a very similar shot taken in Phuket once. Going beyond all that, however, there’s a very strong familial theme running throughout the film. Though Malek is shown to be keen on keeping his hands clean, at the same time he is also incredibly concerned about the welfare of his mother (Wan Maimunah) and his sister, Zeti (Sheera Iskandar). Zeti’s wild ways, however disconcerting it may be, does not quite compare to his fears for Jai. While Jai has, in some small ways as illustrated above, retained some sort of compassion, it is also clear that his desire for money drives him be more and more involved as a gangster. It is this desire that I find interesting to delve into further before we move on. If you wish to conduct a more social analytical approach to this film, then the statements this film appears to make makes it all the more intriguing for viewers. The gangster lifestyle is portrayed to be lavish, with an almost buffet approach when it comes to money, power, violence and women. Those who do try to live on the bright side of the law, however, find their paths a little more difficult to navigate; a touching early scene sees Malek, as he tracks down his mother, having second thoughts about his choices. His mother is selling some keropok on the street, not unlike the old ladies who do the same outside the Maybank at Taman Tun. The effect always breaks my heart, and it is the same here. A subtle, short scene, but effective enough for sure, and one that raises more questions than answers in a positive way, as it damn well should. Security at Kamunting is tight. 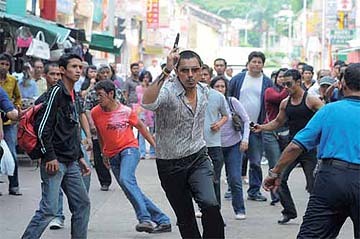 It is an issue dealt with in a more direct fashion with Jai, who cherishes the life of a gangster. As a character, he could not be more contrasted to Malek, who, despite the best of intentions by both the character and actor, appears to spend much of the film bumbling from one scene to the next. He, for someone who is supposed to be determined, is revealed to be a man with not much of a plan, except to stay out of trouble. I find that somewhat interesting to consider, especially when Jai appears to have clearer objectives in life. I find him to be the more compelling of the characters to be attached to, and the inevitable battle between the two was one, I was surprised to discover, I relished. I do wish, however, that more attention had been paid to other details, like the connection between the different scenes. Some scenes appears to be nothing more than a show of strength from one warring group of gangsters to another. Very strong actions were taken, very colourful words were spoken, and it appears as if their respective members were ready for war. Instead, with the build up at its peak, the scene that cuts away to the next, leaving me feeling rather unsatisfied. Quite frankly, even with the removal of the logical question to follow (well, what happened next? Did they beat each other up or did they just part, throwing dirty looks at the other? ), this playing around with my emotions did not sit well with me, and I think it could have been better dealt with by the director. The return of Take That have inspired copy cats. Perhaps therein lies the crux of why this film flickers with life at certain parts, almost inspirationally so at moments, but falls flat on its face in other scenes. With Syamsul Yusof serving not only as the film’s director and actor, but also as one of the editors, the scriptwriter and probably more, I wonder whether he is not better served picking just one role and sticking with it, at least for one or two films. For the most part, I’ve seen a clear progression from his first film till now, but given how the juggling of different roles on the same production can be most taxing, I wonder whether the leap to a truly great film by Syamsul Yusof can only be achieved, ironically enough, by breaking with the pattern of roles he has set for himself. I will point out, however, my great disappointment at the film producer’s lack of willingness to create and use original soundtrack. I detected music ranging from films such as ‘Inception’ to ‘Swordfish’. I have no doubt that they have the clout to actually engage composers to do so; at the same time, it would help to give credibility and experience to those who can do it well. I mean…’Swordfish’! That was ten years ago, wasn’t it?! Ah well. I still think this film had more heart that ‘Transformers 3’. How about that? Malaysia’s highest grossing film of all time outperforming the highest grossing film of all time in Malaysia. Fikri saw ‘Swordfish’ with his mother. ‘KL Gangster’ won the award for Best Directing, Best Screenplay, Best Editing, Best Supporting Actor, Best Sound Design and Box Office Film at the 24th Malaysian Film Festival.